Healy Group owners (from left) Tony Nyers, Rich Preuss, Chris Rowland, Matt Urbanski and Randy Raciti. He aimed to make 50 calls each week. On the phone, he would ask for a face-to-face meeting. If he got a yes, he’d bring along an experienced salesman and listen to the pitch, studying points of tension and connection. He put his hope in a formula—if he made 10 calls, he could get two or three meetings and land one client. It was the spirit of Babe Ruth, the baseball legend, who set the record for home runs while simultaneously setting the record for strikeouts. 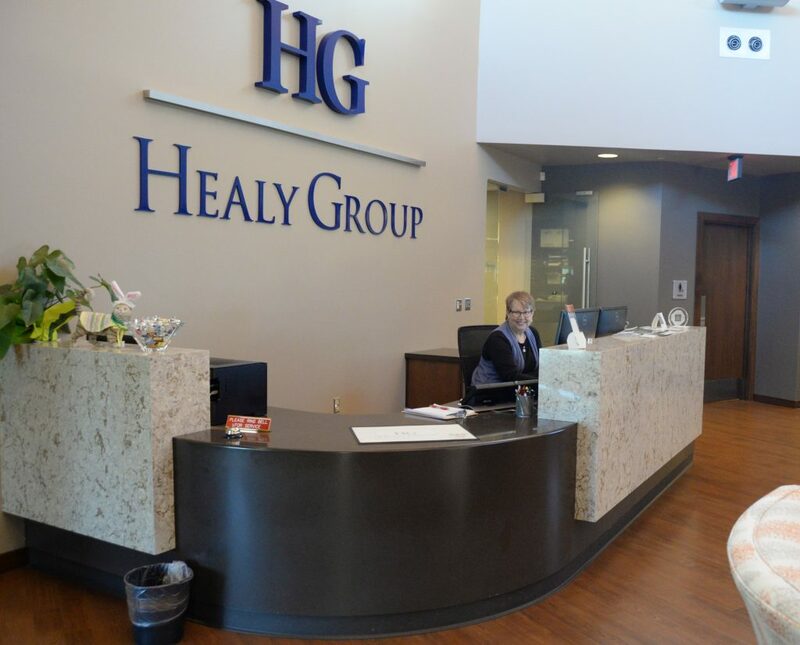 Built on the little things, Healy Group is much larger today than it was in the 1980s—with 41 employees spread across four divisions. 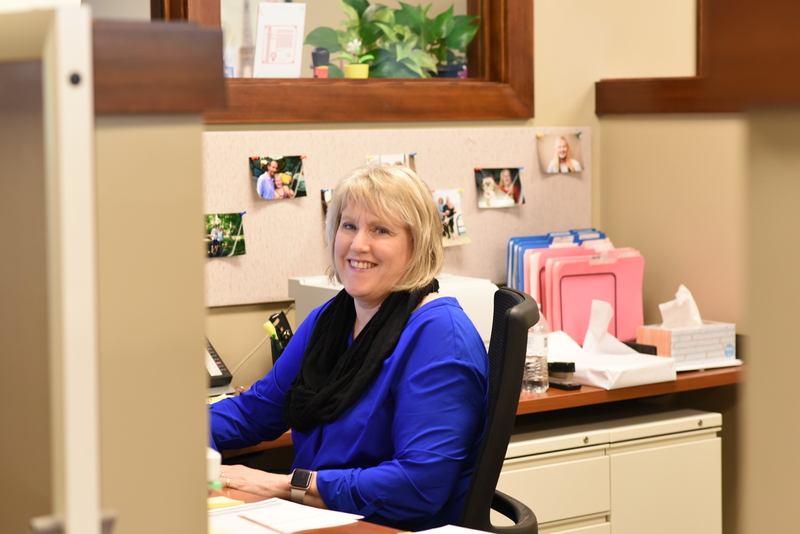 The life insurance work that Rich began with morphed into a broader financial planning division, employing Rich, Randy Raciti and Matt Urbanski, plus community members Christin Rose, Joe Cramer, Linda Mooney and Claire Mysliwiec, and five other employees. 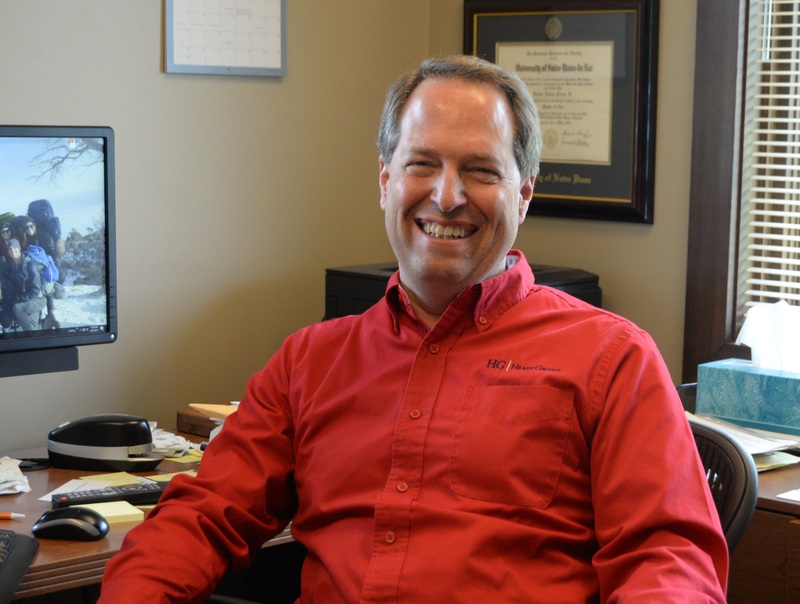 Chris Rowland leads a separate division with 12 employees focused on employee benefits. Another community member, Tim Pingel, works in the insurance division. The mortgage division is led by Mike Morin, a Trinity School at Greenlawn parent. Growth did not come fast, but it has accelerated recently. “It took us 23 years to get to 10 employees,” says Randy, Healy Group’s president, noting that in 2015 the company added 10 employees in a single year. In 2014 they moved into their new 12,000-square-foot office building, which they designed with extra space so that growth can continue. Randy started at Healy in 1987. The son of a salesman and entrepreneur who died when Randy was 13, Randy always wanted to follow in his father’s footsteps as a businessman. But by 1987 his career had reached a turning point, so he took a walk with Joel Kibler (Vancouver-Portland). “I have this sense that you and Rich Preuss should be working together,” Joel told Randy, who applied for a job at Healy. He started by selling employee benefits packages and helping individual clients with financial planning. Randy is a dogged worker—as a young man he would rise at 4:00 a.m. and work until midnight, then get up and do it all over again. He’s also a born salesman. “I am very comfortable picking up the phone and introducing myself,” he says. On the phone, he would offer to take his prospect out to breakfast or lunch. Then, over the meal, Randy would spend most of the time, perhaps 40 minutes, listening to his prospect’s story, waiting patiently until the final 10 minutes, when he would tell his own story and offer his services. He and Rich were both aggressive about adding new clients. “One year we had a little personal competition for how many new people we could meet with in the course of a year, and I think we both blew through the 200 new people mark,” Randy says. Claire Mysliwiec enjoyed a Dairy Queen Dilly Bar provided by Tim Pingel, known for offering ice cream treats to his fellow employees. 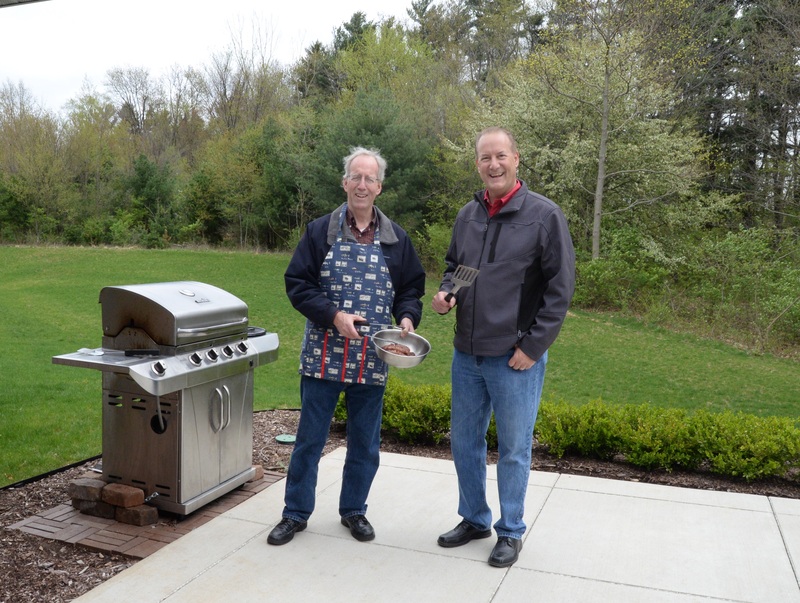 To help their clients, Randy and Rich began using a software program to forecast the amount clients needed to save for retirement. Most appointments were outside the office, so they would bring a 70- or 80-page printed report with scenarios and projections. Inevitably, the client would want to alter the variables—to see the impact of saving more or working longer— so the advisor had to return to the office and rerun the numbers. “That created frustration for us and for the client,” Rich says. 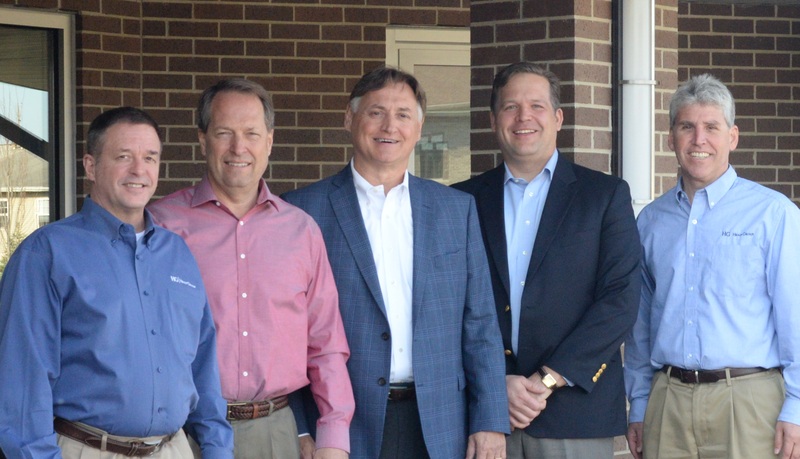 Over time the software improved, and Rich and Randy began meeting with clients at the Healy Group office, where they could run projections on the spot. They also started using a more comprehensive planning process, analyzing a client’s overall level of protection, debt, savings and investments. With a more complete picture, they noticed ways to save the client money. By 1999, Randy’s efforts had begun to blossom, and he wanted to go full-time as a financial planner. 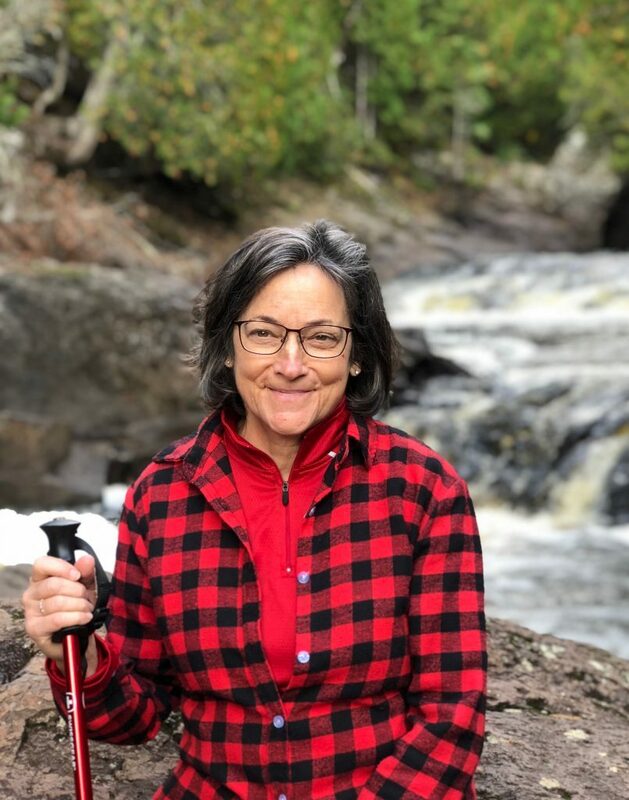 Chris had been working in employee benefits since 1985, when he graduated from Notre Dame with his M.B.A. As an undergrad, he had majored in philosophy, but had developed an interest in business. In graduate school he first learned about the up-and-coming field of employee benefits. A young married man, he saw a chance to do good for people while also providing for his family. He worked for two different companies in South Bend before joining Healy in 1999 to take over, and eventually expand, Randy’s employee benefits portfolio. “The mindset that we’re helping build the kingdom of God when we take care of people, that we’ll go above and beyond the call of duty—that attracted me,” Chris says. Employee benefits work has different rhythms from financial planning. 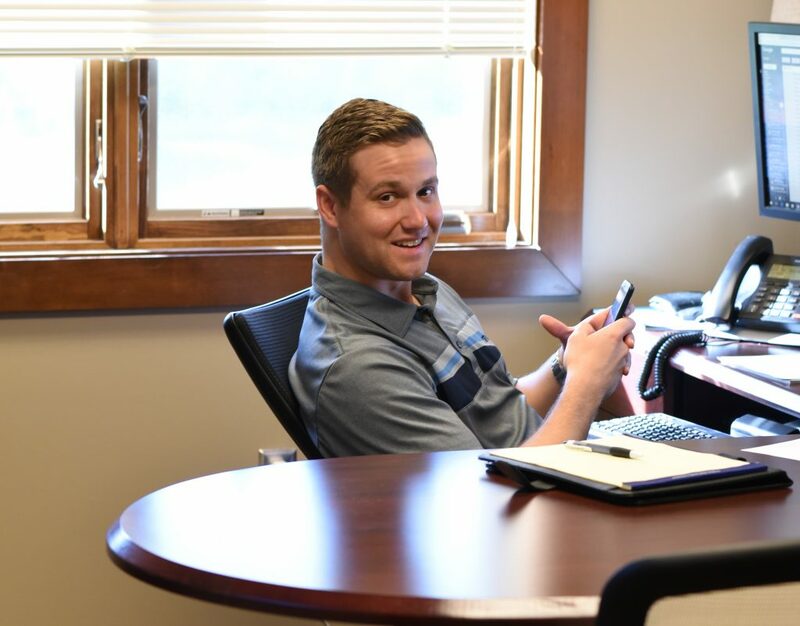 Most of Chris’s clients are businesses—small companies, nonprofits and larger corporations. Chris and his staff of 12 act as middle men between the companies who sell group health, life and disability insurance packages and the companies providing insurance to their employees. They negotiate contracts, offer ideas and answer questions. 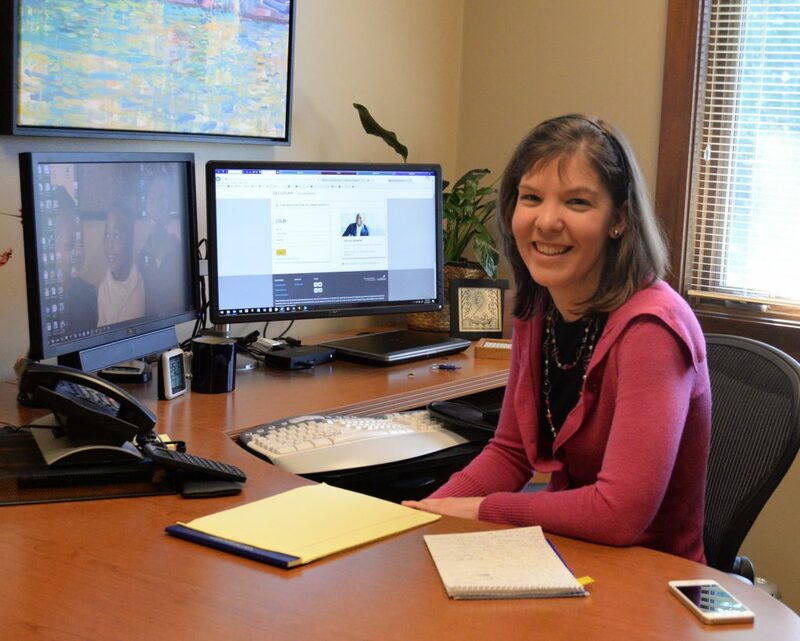 Health insurance costs are always rising and regulations changing, so a lot of the work Chris and his team does is educational—teaching human resources departments about changes in the marketplace, teaching employees about changes to their plans. “We want to work hard for our clients to make sure problems are resolved and that they can afford to offer health insurance to their employees,” he says. 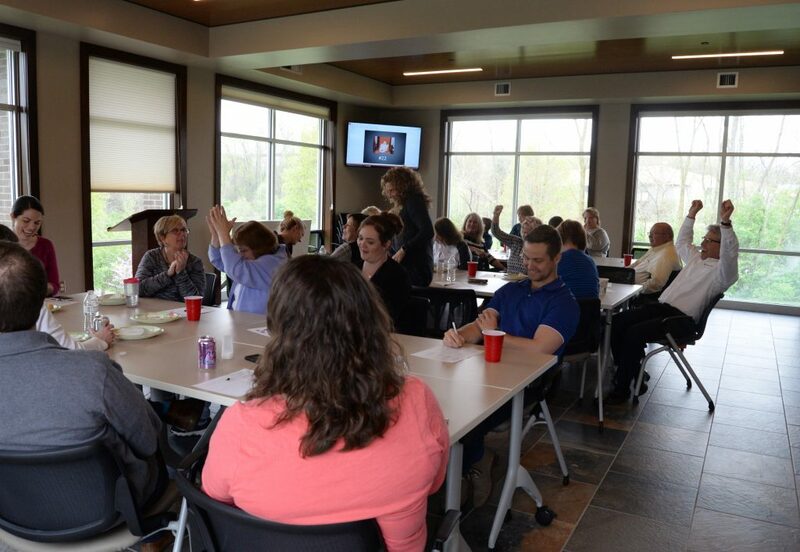 Employees at a monthly Fun & Fellowship Friday lunch in Healy’s community room. If phone calls and sales efforts are the skeleton of the business, then faceto-face client meetings are the heart and soul. They are where the music happens, where “we take on our clients’ problems as if they’re our own problems,” as Chris puts it. Even if the problem is a flat tire. Healy Group employees like to tell the story of a client who rolled into the parking lot on just three good tires. Tim Pingel spotted the flat, and in a meeting he and Rich were having with the client, Tim asked the client for his keys. He asked at least twice before the surprised client agreed. Tim went out to the parking lot, found the jack and spare, raised up the metal hulk, switched the tire, then lowered the minivan back down to the ground, while Rich finished meeting with the client. Employees spiritedly entered into a Friday fun game: identifying fellow employees from their baby pictures. Matt Urbanski tells another story about driving to Bremen, Indiana, to visit an elderly couple he advises. On the way there, he remembered that the husband loves chocolates, so he decided to stop at a grocery store and buy some. Praying while he drove, he asked the Lord what he thought. Much to Matt’s surprise, the Lord prompted him to buy some paczkis instead. (Paczkis are a Polish pastry.) Matt showed up with the paczkis, only to learn that the wife had been hankering for some all day. In fact, when Matt had called earlier, she thought about asking him to bring some, but dismissed the idea as too trivial. Later, Matt prayed with the husband for arthritis in his hands and the wife for neck pain. Both told him they experienced relief after his prayer. Matt is Healy’s newest owner. He started in 2000, but only after putting off the idea for several years. As a college student in the early 1990s, he met with Rich to ask his advice about whether to major in finance or marketing. 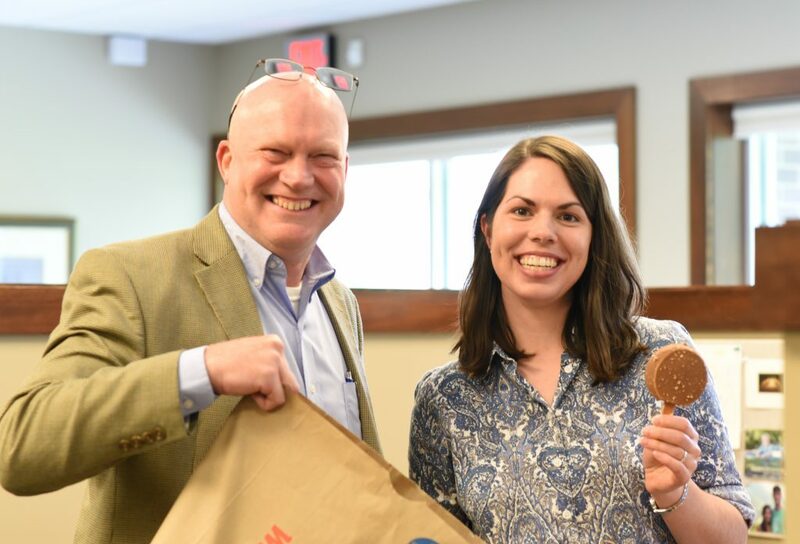 “I don’t think it matters,” Rich told him, “because we’ll hire you whatever you major in.” Matt chose marketing, worked for a restaurant ownership group, then led the development office at Holy Cross College. By 2000 he was ready to try insurance sales and financial planning. He says his first year at Healy did not go well, at least by conventional measures. He worked harder than he ever had, but he brought in less income than he had in his previous job. (Several years later someone told him that 90 percent of financial advisors quit in their first year.) Matt persisted, developing a niche helping young families who wanted life insurance and whose incomes would grow over time, giving them more money to invest. He can still recall two phone calls early in his career, when he learned that two of his clients, both husbands, had died in tragic accidents. Matt usually recommends that clients buy enough life insurance so that the payouts could replace the client’s income if the client were to die. Because these clients had followed Matt’s advice, Matt knew that the widows would not have to worry much about money. 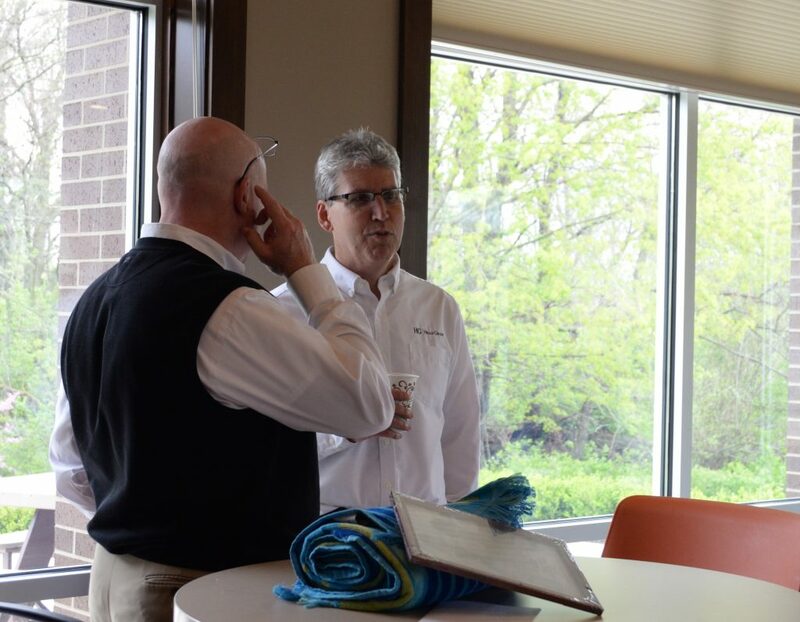 Tim Pingel and Randy Raciti chatted at the most recent Fun & Fellowship Friday event. Regarding perspective, Randy recalls a conversation with Rich that began as a discussion of standard business metrics: revenue, profit and the growth of the company. Then Rich abruptly changed the topic. “I think we should just focus on what the Lord wants us to do with the relationships we have, and just continue to respond to the Holy Spirit and keep taking steps,” Rich said. “The story of Abraham serves as a good guide for us,” Randy says, for Abraham proved “faithful in small things” and became the father of many. 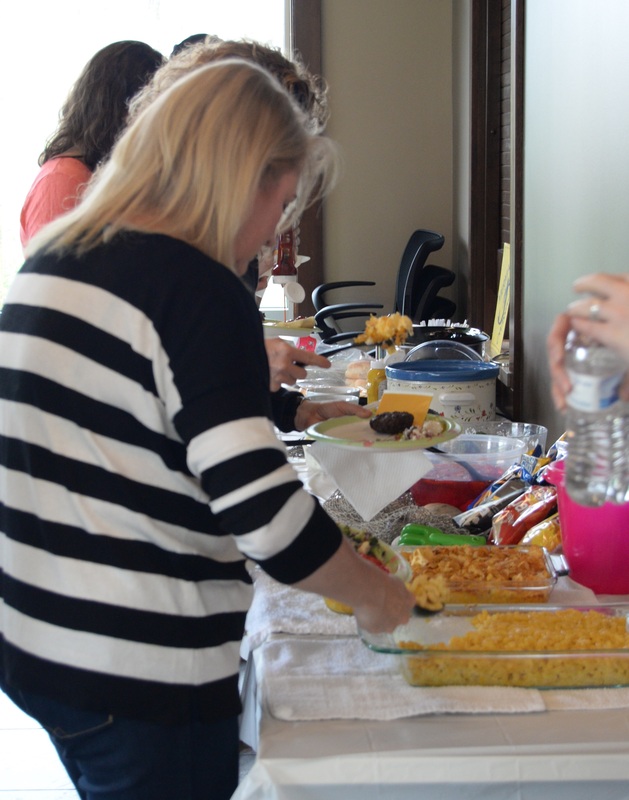 Employees take turns preparing food each month. Matt Geary and Terry Graber grilled.